Series two of this BBC hit drama is back and is joined by two new wives to spice up the drama. 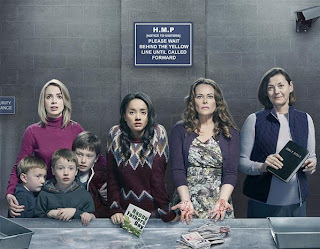 Joining Francesca Miller (Polly Walker) and Harriet Allison (Pippa Haywood) are 'Misfits' star Karla Crome and 'Shameless' star Sally Carman who play Aisling O’Connor and Kim Haines. This four part drama is no 'Desperate Housewives' so you won't see these wives sleeping around with gardeners or nosing around their neighbours house. However, you will see plenty of emotional drama. Each wife has different scenarios that brings them to the prison - Francesca Miller is a glamorous woman who clearly likes the finer things but has had to put her fabulous life on hold to be the breadwinner while her husband is locked up, even if the job seems dodgy. She is the mob wife out of these women and as you see throughout this series, Francesca steps more and more into the dark side. Kim Haines is the devoted mum and wife to her family - you could say they have the picture perfect life until her husband is sent to prison for accusations of child molestation. Kim’s life is torn apart and a dreaded secret she is hiding seems the only way of saving her husband but destroying her family at the same time. Not all of these 'Prisoners’ Wives' are actually wives, Harriet Allison an anxious (and slightly crazy at times) mother whose son is in prison. Like the blossoming flower of this show, she is experiencing different things since her son has been in prison. This series she has found love, which will see her putting her happiness first to the disapproval of her son. And finally Aisling O’Connor, a loving daughter who is getting sick of her repeat offending dad. Aisling is set to tie the knot and wants her Dad to be at her wedding walking her down the aisle, but with the temptation of petty crime on his mind it will be hard to see that happening. It takes a lot of persuasion to get me into any old drama, but after watching 15 minutes of 'Prisoners’ Wives', I was screaming at the television screen. This series looks more action packed than the first series and with the series finale tonight, I would highly recommend catching up with the series. 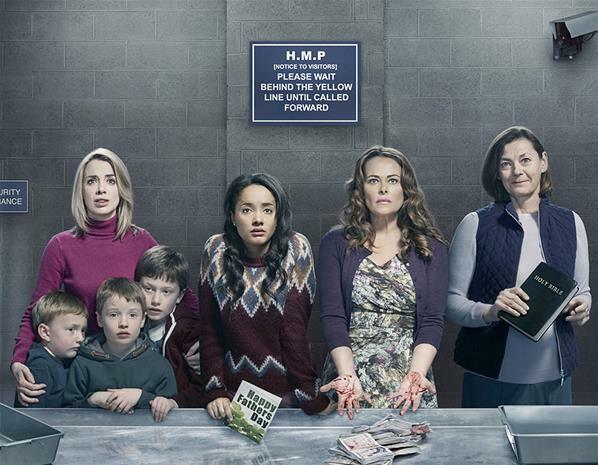 Catch 'Prisoners’ Wives' on BBC iPlayer. The television channel that brought you 'Geordie Shore', 'Jersey Shore', 'The Hills' and 'The Valleys', unveils their newest horror - 'Catfish: The TV Show'. The programme follows people who have found love online mostly through Facebook but have not met face to face yet! Based on the documentary film cleverly called 'Catfish' staring Nev Schulman who got himself involved in an online relationship but to find out the attractive girl he was talking to wasn't quite who he thought she was! But instead of running a mile like most people would he claims they became friends...interesting? So on to 'Catfish: The TV Show', each episode follows a similar pattern even though there are those shocker episodes! They receive an e-mail from someone who has been talking to someone online for so many years, they have never seen each other and some have never spoken on the phone but want to meet the “love of their life”, and YES! They seem very serious as they say it! So Schulman and his film crew buddy Max Joseph go to see this person and start an online search. Usually they find another profile of someone that lives in Russia and go to inform the person. The lovesick puppy is told the information but still wants to meet whoever this person is. So they travel to a destination, get to a house, knock on the door and then...their dreams are crushed as the person that has come out is not the person who they have been talking to. Now don't get me wrong at all, I love watching 'Catfish: The TV Show' and there are quite a few episodes along the way where I have jumped out of my seat with shock. However most of the time I just want to go “I TOLD YOU SO!” right at the television screen. Compared to some of the other shows MTV has, 'Catfish: The TV Show' is like is a fine wine around all the ASDA value wine. Catch 'Catfish: The TV Show' on MTV Mondays at 10pm or on MTV On Demand.